Hola (Hello) and Welcome to Day #7 of Chocolate and Spices Theme Week. 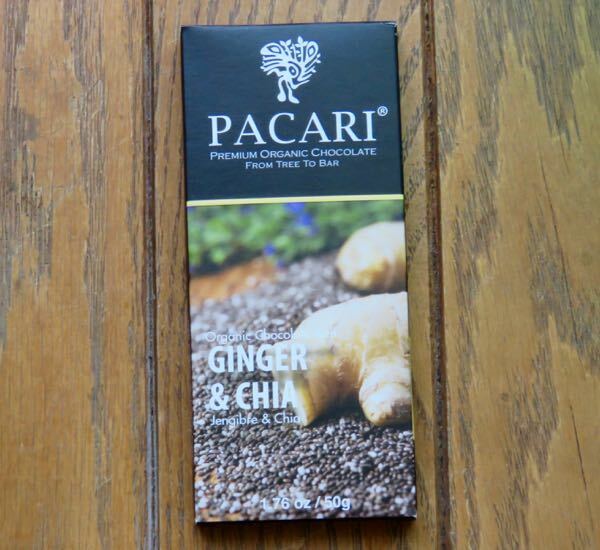 Today's Organic Chocolate with Ginger and Chia bar from Pacari* (Quito, Ecuador) was made from "tree to bar" in Ecuador, where cacao has been grown for centuries. Chia seeds also are from South America. 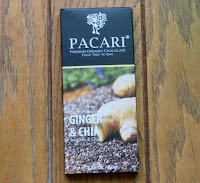 The chocolate had a buttery melt and a delicious and subtle natural ginger flavor; and the chia provided a hint of texture. Labeled as organic, soy free, gluten free and vegan, this bar was made with arriba nacional cacao--a type of fine flavored cacao grown in South America. *Pacari works with Kiwa BCS Oko-Garantie GmbH on organic certification.